At the outset, let me (Pervez Cooper) thank Namaste Tourism for having booked a fabulous holiday for me and my wife. All the three Cities were super. Paris (France), Interlaken and Lucerne (Switzerland). Paris was magnificent in its own way. The old heritage and history of the City is commendable. All the attractions were too good. The Eiffel Tower was looking as fabulous as the City. The Louvre was breathtaking and absolutely fabulous. The Palace de Versailles was truly magnificent. As regards the shopping, Galeries de Lafayette was just superb. As regards the food. We tried a lot many Cafe’s around the Louvre and the Moulin Rouge. Our second destination was Interlaken. Absolutely fabulous with it’s fresh air and beautiful people. Traveling by train in Switzerland was truly a experience in itself. Plus the Swiss Pass helped us to see many places by train as well as by bus. Lucerne was our last destination. Truly serene and beautiful. 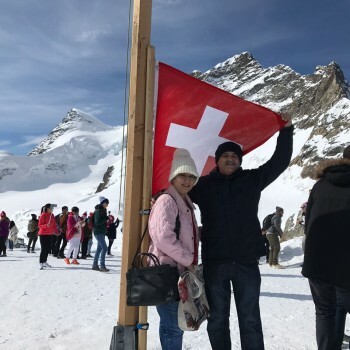 Mountain Titlis and Jungfraujoch were just amazing and the ride in the cable car amongst the snow capped mountains was truly beautiful and magnificent. As regards the hotels at all destinations. Paris Hotel, Moulin Plaza was very centrally located and was good in its way. The Hotel in Interlaken (Swiss Chalet) was super. Friendly receptionist and breathtaking view from the Hotel room. The Hotel in Lucerne (Seeburg Hotel) was again fabulous. Our room faced the Lucerne lake with a super view. All the above hotels served good breakfast.